What happens when we die? How are we judged? How do we prepare? These are some of the questions addressed in this book. Catholic and scientific literature, as well as interviews with those who have had brushes with death, provide glimpses of the afterlife. 120 pgs. The continuous True Presence of Christ with us in the Blessed Sacrament is good news worth sharing! This book of heart-felt reflections on the Holy Eucharist demonstrates that devotion to this profound Sacrament is fundamental to our Faith. As millions flock to alleged sites of supernatural significance around the world, we sometimes overlook the most humbling sites of all - our own Churches and hearts where Christ chooses to dwell Eucharistically! 96 pgs. 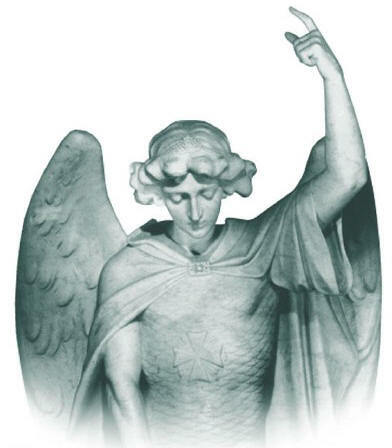 Society is currently fascinated with angels and other spiritual/supernatural phenomena. What does it mean? Many denominations report this as God's call for mankind to reform. Includes insights from Pat Robertson, Billy Graham, Fr. Stefano Gobbi and Pope John Paul II. 320 pgs. The dynamic autobiography of a contemporary mystic, suffering servant, and victim of Communism. Published before dramatic changes in Europe and the Soviet Union, it is a story of supernatural events and accurate predictions. Now available in the original cover, depicting Josyp's meeting with Pope John Paul II. 344 pgs. Spiritual warfare is at an all time high! In whose army are you a member? A riveting account of front line action in the eternal battle between good and evil as experienced by best-selling author Michael H. Brown. Parapsychology, a brush with the Mafia, and fascinating encounters with the supernatural make Michael's story something you will not want to miss and inspires all to join in this spiritual warfare. 256 pgs. Akita, Betania, Fatima, Garabandal, Knock - all are obscure places on the maps, or are they? Has the mother of Jesus appeared at these and other international locations? Why? Investigative journalist Michael H. Brown provides compelling information about our extraordinary century. This all-time best seller includes a fascinating look at secular history and Biblical prophesies! Excellent photos. 368 pgs. Spirit Daily is a daily internet news site geared toward spiritual news, and this book was conceived because of the many requests we have had from readers for back articles. The Best of SPIRITDAILY, a compilation of some of the more interesting stories weve carried in our first year and a half of existence (May 13, 2000, to the winter of 2002). Appearing on a particular day with certain events in the world swirling around them the articles are about self-help, personal spiritual development, the charisms, prophecy, deliverance, Vatican news, and much about the Virginfrom Fatima to Medjugorje! Youll find the articles both fascinating and enlightening, and that in some way they will help on your journey to Jesus. Are you concerned about Global Warming? Could a series of MEGA DISASTERS be about to occur? Find out what the scientists really say. 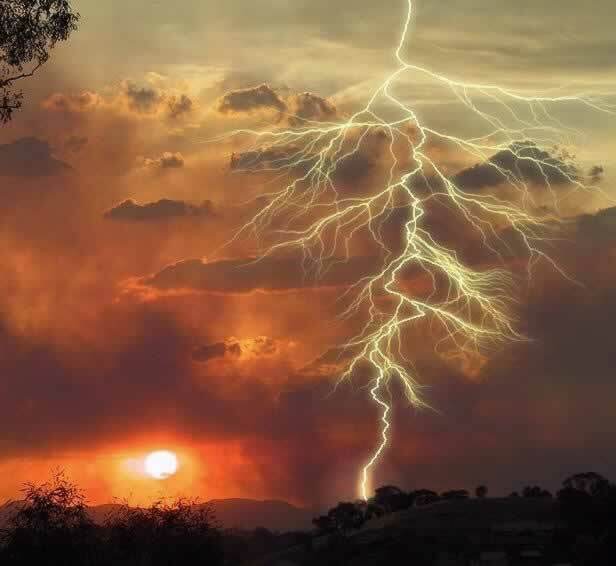 Best-selling author, Michael Brown, interviewed over 300 of the worlds leading scientists to reveal fascinating information which seems to be leading to a series of mega disasters about to visit our era. Michael takes you back to 1846, LaSalette, France to begin to uncover the story. The end of the world? No! Could God be tapping us on the shoulder? Journey with Michael as he uncovers the startling truth. 336pp. Mary is the most famous, the most loved and revered woman who ever lived. She is the greatest and holiest of all the saints. We all acknowledge the life-giving importance of her "yes" to God's plan, which caused God's Son to take flesh in her womb. But few appreciate the role she has played throughout the course of history. Here for the first time in one volume, award-winning journalist Michael H. Brown tells the story of Mary's apparitions, her miraculous interventions, and her secrets since the first century. In the past, says Michael Brown, when humanity has struggled with the forces of evil and has endured severe troubles, Mary was there with us, bringing aid and wisdom. Now as we face a new millennium, we need to reflect on what she has done and what she has said. Mary's "last secret" is personal for each of us, and as the author presents it, he unveils her purpose in our lives today. Does God really heal? Does He really watch over your life? Does He really cause all those fateful happenings and triumphant moments and coincidences that mystify us? Michael Brown demonstrates that the clear answer is Yes! God is with us in ways we can hardly comprehend. He is closer than our shadows and wants the best for us. He wants to heal and fix the broken heart, the busted spirit. It takes action and holiness on our part and the living of several basic principles. In this book you will read about the remarkable way that miracles have occurred during natural calamities, including hurricane Katrina. You will see indications from the other side of the veil. You will see examples of extraordinary coincidences that prove beyond any skepticism that God can do whatever He wants whenever He wants and responds to us when we exhibit the characteristics of Jesus: Love, Patience and Humility. Read about cancer and AIDS patients who have survived beyond all odds about the strange way God can even connect people through the telephone. Learn about astounding signs and about those who have overcome the most intimidating and evil of circumstances through prayer and faith in dramatic settings. Problems in the family? Hurricanes? Earthquakes? There is nothing that is beyond The God of Miracles who only waits until we learn to call on Him. his most powerful book since The Final Hour -- a book of huge coming events. Focusing on two prophecies since 1990, Brown shows how world events, effects in nature, evil in society, and bizarre creations of man -- from synthetics to genetic manipulation of humans themselves -- are bringing us to an incredible tipping point in human history, the brink of fantastic change, a struggle that will involve an anti-christ, Jesus, and a coming mysterious manifestation. For years we have heard about apparitions. For years we have discerned signs and wonders. 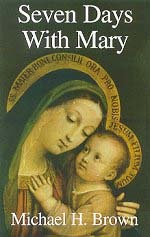 Now comes this book of devotion based on the most ancient and solid of Mary's historic apparitions. Every apparition used in this book has been formally approved by the Roman Catholic Church. Taking one of Mary's appearances for each day of the week, author Michael H. Brown explains their often hidden aspects and offers prayers and meditations to go along with each one, a week of prayers aimed at bringing a week of "special graces." 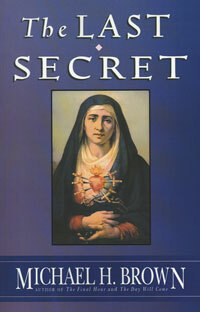 When you finish this book you will experience a feeling of peace and greater love for the mother of Jesus. a brand new faith-filled and journalistic look at what happens when we die -- including in-depth descriptions of death, the parting of the soul, 'judgment,' transition to the other side of the veil, and the various regions which at the highest reaches will astonish you with their splendor and light! Of all his books, one not to miss because no other could be as important! Actual testimonies from those who 'returned' and insights on preparing for the wondrous day we all can joyfully reach! If you liked The Final Hour, After Life, or The God of Miracles, you'll enjoy this fresh information that takes matters another step! 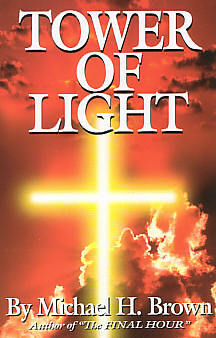 Tower of Light, by Michael H. Brown, his most powerful book since The Final Hour -- a book of huge coming events. Focusing on two prophecies since 1990, Brown shows how world events, effects in nature, evil in society, and bizarre creations of man -- from synthetics to genetic manipulation of humans themselves -- are bringing us to an incredible tipping point in human history, the brink of fantastic change, a struggle that will involve an anti-christ, Jesus, and a coming mysterious manifestation, a book that has sold faster than any in this website's history. All-time Best Seller on apparitions and prophecies. Betania, Fatima, Garabandal, Knock. A fascinating look at secular history and the Bible. Excellent photos. Dive into the secret spiritual aspects of the last 100 years. Terrific photos. (Best Seller). Featured on NBC, Sally Jessy Raphael, EWTN. Popular since 1993. Cherry Hill, New Jersey, October 13 -- five hours of video, five separate talks -- on personal healing, deliverance, spiritual development, prophecy, what happens when we die, family healing, spiritual warfare, what is going on in society, and much more, complete coverage of the day-long retreat that has caused more powerful reaction than any talks in the author's last 15 years, with prayers, devotions, humor, and the seriousness of such matters as curses, the afterlife, and coming events! (with Michael Brown) The dynamic autobiography of a mystic in the Soviet gulag! His suffering, his visions, his apparitions of the Blessed Virgin Mary (many photos, Best Seller in 1990s, full of dramatic accounts). Follow the drama as a boy becomes a man in the Godless Soviet Union -- and refuses to reject his faith. You'll be astonished not only of his supernatural encounters -- in prison -- but his enormous strength of faith! The Seven, a prophetic novel by Michael H Brown A coming sign? Events by a sinister personage? Disaster? In his first work of fiction, Brown pens the driving, suspenseful, and deeply spiritual story of a mysterious government property that harbors secrets relevant not only to a young cop who tries to investigate strange goings-on, but also to an equally mysterious and incredibly powerful old priest who joins forces with him to solve the mystery -- and try to prevent an end-times-like disaster! Are there implications for the current world scene? Could any of the fictional possibilities one day play out in the real world? a brand new book on the supernatural realities around us -- around every person. Read of current encounters on deathbeds, in hospitals, in everyday life, in 'haunted' settings that finally get a Catholic explanation (as even St. Augustine spoke of their effect, and saints like Padre Pio saw them). Demons, angels, spirits of the deceased, purgatorial souls, often affecting us in unseen, unsuspected ways and dispelled through deep prayer in the Name of Jesus when we know how to do so and approach them with Catholic faith, prayer, and love! A book of inspiration, hope, and enlightenment by a Best selling author who has compiled and adapted the many popular articles he has written online for this little tour de force that covers a multitude of issues -- from healing and deliverance and joy and peace to preparing for death and the afterlife -- each chapter (there are 43) a little essay or article on how we pray best, how we purify, how with God there is always hope (an 'exit'), how we rid fear, obsession, attachment, what to do when we hit 'rock bottom,' and much more in his most exciting book in years. Best selling author of The Final Hour and The Other Side: a major work on prophecy based on recently approved apparitions as well as a mysterious private one that see events in the world soon reaching a 'crescendo,' with events in society along with nature indicate truly transforming moments ahead -- events that will turn society and the very landscape around us into a very different place as the Lord moves now to prevent permanent damage to His Creation -- and to our souls! A book that discusses everything from a new world order to cultural evil to natural upheavals that seem -- mysteriously -- to hint at coming fire. A fascinating, in-depth look at what happens when we die, how our lives are viewed by God, and where we go! By the author of The Other Side and Afterlife, bestselling writer Michael H. Brown; actual experiences. Can God heal anything? Are there really extraordinary miraculous cures? Spiritually and physically, can we prevent many of the diseases ravaging modern man? These are some of the questions approached by bestselling Catholic author Michael H. Brown in this book covering the breadth of natural and spiritual healing -- how we can improve our health and well-being -- and often longevity -- through changes in lifestyle and spiritual outlook. For when there is darkness inside, it is often reflected in sickness outside. Can disorders be demonic? What about nutrition? What kind of spiritual approach is the most effective? What are the changes must we make in our lives? Read of those who have recovered almost Lazarus-like, of the man who was in a state of rigor mortis when a simple prayer brought him back, of those whose simple faith has rescued children and others from autism, paralysis, cancer. This is a book of miracles. 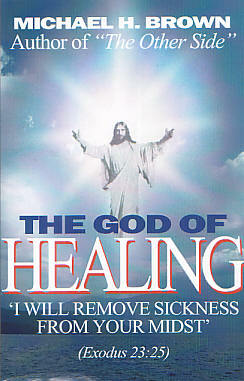 It is a book that follows what Scripture says about supernatural cures. It is a book that clearly and powerfully demonstrates that Jesus heals as much -- or more -- today than He did when He walked this earth. Mental, physical, or spiritual: our health is important to God, and while there are cases of "redemptive" suffering or sacrifice, there are times in our lives when we bring poor health and disease upon ourselves, sicknesses that we often have the power -- with Jesus -- to cast out of our lives and live life with joy, fearlessness, and more abundantly! by the young adult prayer group at St. Maria Goretti Church. Vol. I-Sept. 1988-Sept. 1989 144 pg. Vol. II-Sept. 1989-April 1990 112 pg. Vol. III-May 1990-July 1991 96 pg. The bountiful graces of Eucharistic Adoration are flowing thanks to a widespread revival of this beautiful devotion. This booklet was designed to enhance your time spent with Jesus in the Blessed Sacrament. It includes a prayer format to use in Adoration with rosary meditations, prayers and spontaneous meditation topics. 120 pg. Holy Hours led to the completion of a second book. It contains additional meditations for prayer time but no traditional prayers. 64 pg. Rosary, Jesus Rosary, litanies, and Seven Sorrows Chaplet. Excellent for prayer groups or individual use. 96 pg. Jesus Rosary, litanies, and Seven Sorrows Chaplet. Excellent for prayer groups or individual use. 96 pg. Colossians 1:20. And through him to reconcile all things unto himself, making peace through the blood of his cross, both as to the things that are on earth and the things that are in heaven.